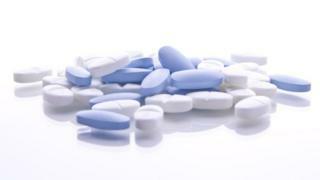 Half a million unlicensed erectile dysfunction pills have been seized from a house near Slough. Police and government officers raided a property in The Myrke, Datchet, and found the medicine worth more than £1m. A 37-year-old man has been arrested on suspicion of possessing an unauthorised medication, knowing or believing it would be supplied to another person. A government spokesman said: "Selling unlicensed medicines is both illegal and poses a serious health hazard." Enforcement officers from the Medicines and Healthcare Products Regulatory Agency (MHRA) joined police in the raid on Wednesday. MHRA Head of Operations, Danny Lee-Frost said: "People should think very carefully before purchasing pills on the internet because you have no idea what you may be taking or where they come from. "To protect your health, visit your GP, get a correct diagnosis and buy medicines from a legitimate high street or registered pharmacy which can trade online." The arrested man has been bailed until 10 February.